Libertyville, IL - His Eminence Metropolitan Christopher of Midwestern America ordained Petar Sailovic on Saturday August 2, 2008, the feast of St. Elijah the Prophet at St. Sava Monastery in Libertyville, Illinois. 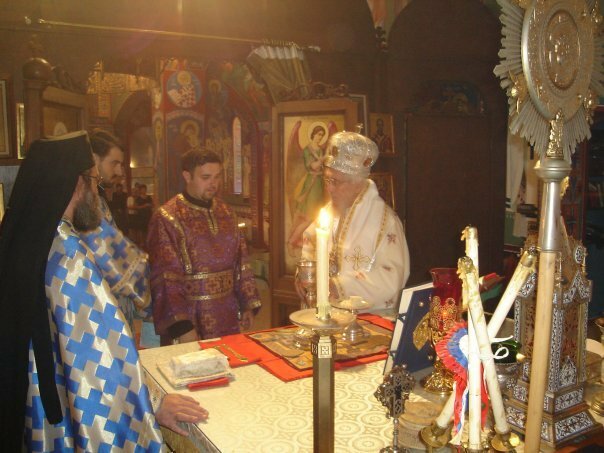 The newly ordained Deacon Petar finished the Seminary in Belgrade, Serbia and continued his studies at the St. Sava School of Theology in Libertyville, Illinois which he completed in 2005. He is married and has a daughter. God willing, he is to be ordained to the Holy Priesthood on the feast of the Transfiguration of our Lord and will be asigned to the St. Sava Monastery and Cemetery. He will also work as librarian at the St. Sava Theological School.